Let’s face it it is 2019, Spring is 55 days away, and you cannot wait to do events at your place, or if you are getting married you cannot wait to host your first event. Am I right? I am one of those where I like to keep things simple, but the Lord knows I love my glam! So here are a few things that you can do WITHOUT breaking your bank account cause child I know for a fact we ain’t rich like the Kardashians. 1. WIFI– Be honest, if your party is bomb everyone would want to snapchat, instagram it, or even facebook it. However, some need the wifi code and it can get annoying when people ask you the question: “Do you have wifi?” So make it simple for everyone and try to have small cute chalkboards (DOLLAR STORE!) in some parts of the house with the password to your wifi. 2. Drinks– Oh ya’ll are going to love me for this one, but why buy expensive drinks when ya’ll can get it at Aldi? Did you know that now they offer award winning wines? Look it up and thank me later lol! 3. Food– Aldi, again is my very best friend! From wine, to pizza, avocado, and more you can get food there for a very cheap price. Not only are the prices awesome, but the food is so good. 4. Ambiance– Create an ambiance that is perfect for your theme party. Beautiful center pieces can be found at an affordable price at the dollar store. You can even get amazing lights or some call it “fairy lights” at 5 below! Make sure that if you have music try to keep it within your theme. You don’t want slow music when its a party that is an upbeat. 5. Potluck– When people are skeptical about what you may serve they start to ASK! You might have friends that are vegetarian, or some that are allergic to a certain type of food. To keep it on the safe side, you can do a potluck party and create a game out of it! For example, let them bring what they want and people can enter a raffle in guessing who got the recipe right! The raffle can be something cute that you can diy so make it fun! 6. Casual– Some people cannot afford to buy a whole new outfit so when you do a party keep it casual! Make sure that everyone wears what they want so they can be comfortable in your house. Especially if you are on a budget do not go overboard trying to make your event even more formal than it needs to be. 7. Cute Notes– Everyone has at least a notebook where guests can write about their best memory at the party. Try to keep this simple and get creative! Instead of a notebook you can buy a colored carton paper, get some gel pens, and let them write on it! 8. Glam it– Try to put some bling into your party, and make people wonder how much you spent! If you have very good cursive handwriting then you can diy a few things like candle holders. 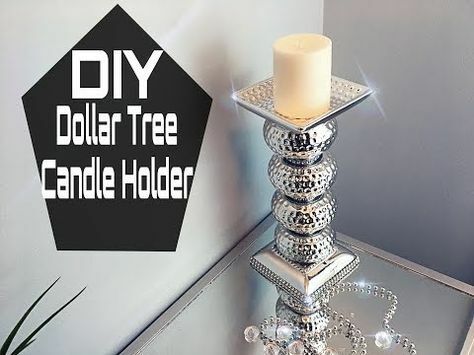 Like for example this beautiful candle holder that was bought at the dollar store, but check out that diy! So do I!!!!! That is the only place I go to so I can feel rich lol! Girl, when I get my place with my man we will have a specific place for wine in the house, and everyone can bring their own bottle! Basically my plan is, everyone brings their favorite, leaves it at my place, we will DIY our glass, and so the next time you come to visit everything will be there lol! Like a bff wine station lol! I love to entertain guests and you have some very nice pointers. The Dollar Store is Definitely my first go too. Thank you so much for your comment! And yes the $1 store can surprise you once in a while lol! This is awesome! I needed some of these tips! I’m so glad it helped you out!